Shady Glen makes a few appearances on CTMQ. One for their Unique and delicious fried cheese plate, one for their burgers being one of Roadfood’s best burgers, and this one – for its ice cream being on that same Roadfood list. 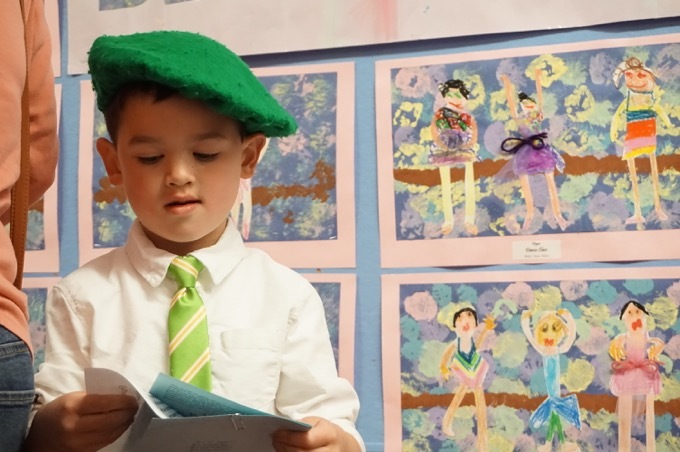 I’m sure I’ll return to the restaurant in the future to try some more ice cream – especially their seasonal flavors, but for now, Damian’s experience will suffice. 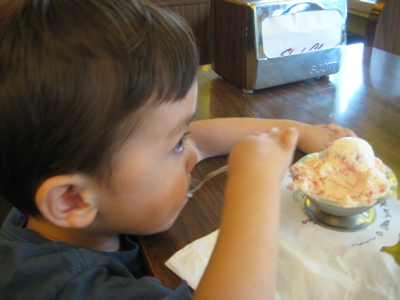 After a quick and delicious lunch, and since he was being such a good little boy, Damian and I shared some of Shady Glen’s peach melba ice cream. Peach melba is a classic old school desert which is simply peaches and raspberry sauce accompanying vanilla ice cream. Delicious. So why not combine the three into one peachy vanilla ice cream with raspberry ribbons woven throughout? Genius! Truthfully, like all of the Shady Glen menu, the ice cream didn’t knock my socks off. Oh sure, it was great and we licked up every last drop, but it wasn’t among the best I’ve ever had. 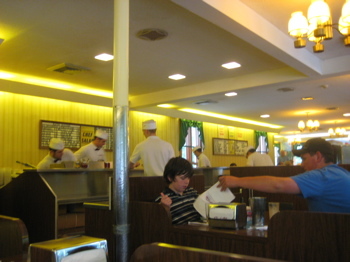 But this was Shady Glen after all, and half the joy of eating there is the atmosphere: Dixie cups of water, menus on the wall, cooks in paper hats, waitresses scampering about in 1950’s uniforms… It is a pretty cool time machine to eat in, that’s for sure. Milk shakes are available in every flavor of ice cream made at Shady Glen — a huge repertoire that ranges from chocolate and vanilla to frozen pudding and grape-nuts ice cream and our personal favorite, chocolate Almond Joy ice cream. Fruit ice creams are made from fresh fruit from local and regional farms and available topped with a semi-sweet chocolate sauce that hardens as it hits the cold ice cream and turns into rich, fudgy chunks. 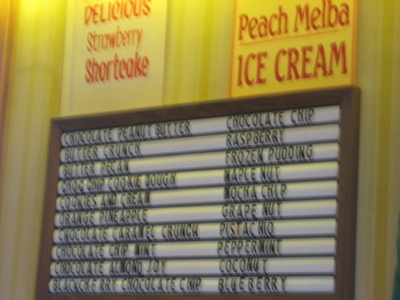 In addition to the regular list of flavors, Shady Glen always has seasonal varieties, such as Christmas ice cream (with red and green cherries) and Thanksgiving ice cream (pumpkin-flavored). Shady Glen may be best known for their unique cheeseburger (four slices of cheese that are fried on the griddle and arranged like huge flower petals over the patty), but it is, in fact, a dairy store where John & Bernice Rieg produce some of the finest ice cream in Connecticut. Malts, sundaes, banana splits, and cones abound, all containing rich ice cream that’s high in both butterfat and taste. The New England favorites Grape-nut and Frozen Pudding are divine, but multiple visits are required for seasonal favorites like Pumpkin and Licorice Chip. 2016 Update: Hm. That’s it? That’s all I wrote seven years ago? That’s not like me at all! I guess I was Shady Glenned out after all the other Shady Glen pages. 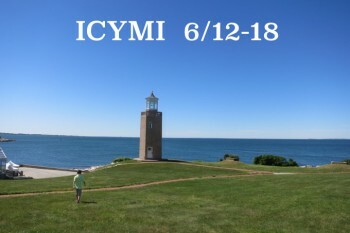 I also lied to you, as I’ve never been back since promising to do so above. Of course, I could go back at some point and enjoy some more ice cream and if I do, I’ll replace this paragraph. For those who can eat peanut butter without going into anaphylactic shock, I recommend the chocolate peanut butter ice cream. Kerri, the fact that you specified that is incredibly endearing. People should always remember to go to the “real” Shady Glen, the original location on West Middle, and not the one in the Manchester Parkade. The food and ice cream are the same in the Parkade, but it’s just not the same atmosphere. I grew up with Shady Glenn. My Mother was friends with the folks that started the business and I went to school with one of the children. there will never be another ice cream like Shady. The chocolate is like no other and their Christmas special and Easter Special cannot ever be duplicated. My husband lived right down the road from the original owners and the Reigs were one of a kind. Lately the cheeseburgers have changed due to a change in the cheese vendor, but it still is great and the cole slaw is like no other…..Always, go to Shady and enjoy all they have……..
Shady Glen Ice Cream (Chocolate Peanutbutter at least) is being served at Rein’s Deli (just off x65 on I84), which makes for a great pitstop on our Boston runs (from Ffld Cnty). Getting the chocolate-cherry bread-pudding ‘a la mode’ made it one of the best desserts I’ve ever ordered. Yum! 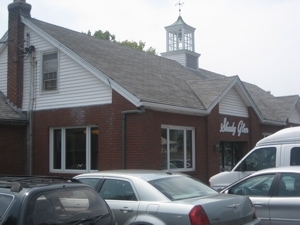 Mom worked for the Reiggs at the Parkade location for 25 years Starting the day it opened….There is no other Dairy Bar that can compare To shady Glen. From the top of the menu to the bottom of all Pure quality and perfection….